By Richard Michael Gramly, Ph.D. This resharpened, but still functional, fluted point is restored from two pieces found separately. The basal fragment was discovered in 1983 at the Vail habitation site. The tip, on the other hand, was recovered in 1980 from the kill site #1, which lies approximately 259 m to the west. Presumably the tip was broken off during an annual caribou hunt and the spear shaft with the basal fragment still attached was taken back to the encampment for refitting. 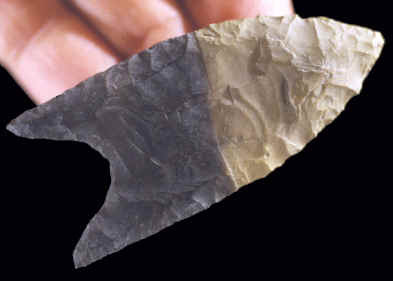 This conjoined fluted point is one of seven restored projectile points from the Vail habitation and kill site complex. The odds of restoring spear tips damaged 10,500 – 11,000 years ago on a hunt are small. At only one other North American fluted point site have similar restorations been made, viz., the Murray Springs site in Arizona. The base and tip of V. 5582-10787 have weathered different colors as they were buried in separate soil zones for thousands of years and underwent different chemical reactions. This specimen has a deep basal concavity, which is 6-7 mm deeper that the norm for the Vail series of fluted points as a whole. The raw material is Cambro-Ordovician chert, presumably from outcrops at Ledge Ridge, which lies a day’s walk north of the Vail site.